Seaside can be pretty chilly, especially when the fog doesn't lift until late in the afternoon. 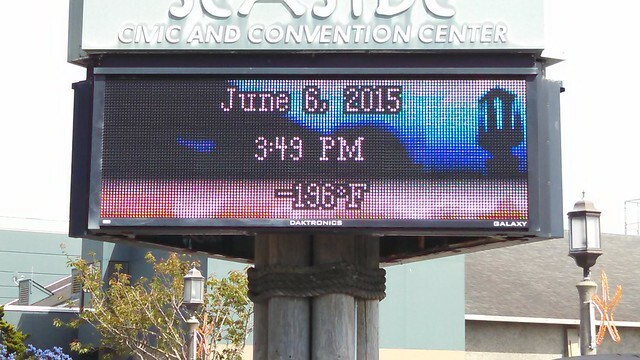 The electronic sign near the convention center was showing 56°F (13°C) when we came over there on Saturday morning. By the time we left, however, it was a completely different story.. While I like it cold, I think -127°C is a wee bit colder than I'm likely to enjoy. Whatever is troubling the convention center's thermometer, it happened again on Sunday. What was that? The Last Dangerous Visions is finally on bookstore shelves?